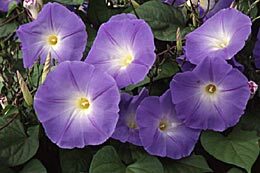 This easy perennial is a popular garden vine, producing flowers in rich abundance and growing to a height of 15-30 feet. Good on trellis or fences. Flowers are bright blue, fading to pink. Vigorous ornamental.